We love Cindy’s adventurous spirit and wanted to get involved. With the funds raised for The Gleason Initiative Foundation, we were able to help out with her trip! Delighted to share this tonight… Team Gleason of Steve Gleason, New Orleans Saints, has stepped up to help Cindy accomplish one of her goals. She wanted to go to Hawaii with her family. She and her wonderful husband AL along with her best friend Marlis took steps to make this happen. An expensive trip for any family, with Cindy’s health needs it was challenging. Finally, everything was in place except for ONE critical piece. Cindy needed a Respiratory therapist to go with her on the trip. A ticket to Hawaii was no small thing. That is when Team Gleason stepped up! 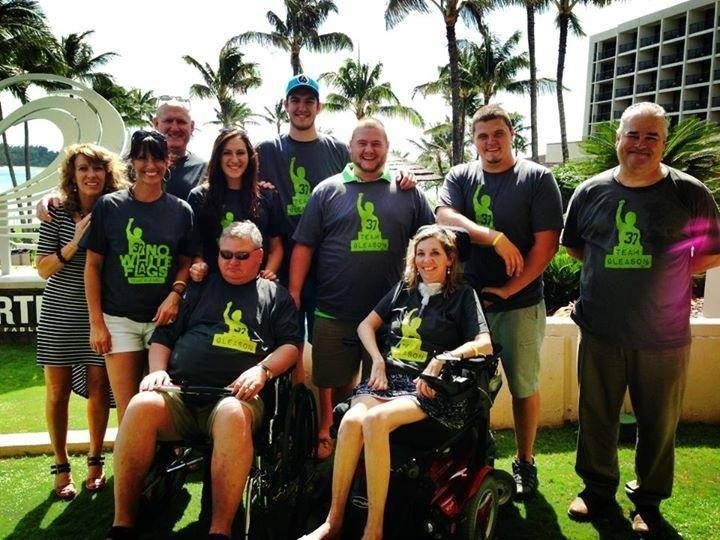 They work with ALS patients who are LIVING with ALS to create opportunities for adventures. They moved quickly to pay for the therapist’s ticket and help Cindy accomplish one of her goals! HUGE THANKS to TEAM GLEASON and to Steve who is a true champion in every sense of the word! #NO WHITE FLAGS! Awesome….Team Gleason is always doing wonderful things!! HAve a great trip!! Team Gleason…. continue to Fight the Good Fight! On August 7th, 2013, my mom, Cynthia Schlude, lost the battle against ALS. I was humbled to see her transformation in just a short 18 month until she lost the fight. My prayers are with everyone who battles ALS. Hopefully research will bring an end to this terrible disease. My thoughts and prayers are with your and the ALS community.